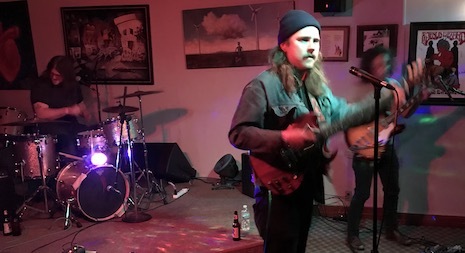 Those Far Out Arrows at The Brothers Feb. 17, 2018. The band plays tonight at O’Leaver’s. Tonight at fabulous O’Leaver’s Those Far Out Arrows headlines a show that includes Australian act Michael Beach. For the life of me, the only info I could find on Beach was his Bandcamp page (below). I like what I’m hearing. Nathan Ma also is on the bill. Show starts at 9 p.m. and is $5. Also tonight, there’s an art/noise show at Project Project, 1818 Vinton St., featuring Big Slur (Dan Scheuerman of Deleted Scenes), Sopor and headlined by jazz/metal/noise trio Giardia. Showtime is listed as 7:30 p.m., no price given. For more info, go here.